Shreveport is a city in the U.S. state of Louisiana. It is the most populous city in the Shreveport-Bossier City metropolitan area. Shreveport ranks third in population in Louisiana after New Orleans and Baton Rouge and 126th in the U.S. The bulk of Shreveport is in Caddo Parish, of which it is the parish seat. Shreveport extends along the west bank of the Red River into neighboring Bossier Parish. Shreveport and Bossier City are separated by the Red River. The population of Shreveport was 199,311 as of the 2010 U.S. Census. The United States Census Bureau's 2017 estimate for the city's population decreased to 192,036. As a 19-year-old, Ashford finished 5th in the 100 m event at the 1976 Summer Olympics. After beating the World Record holders in the 100 m and 200 m in 1979 at the World Cup of Track and Field in Montreal, Ashford was one of the potential medalists for the 1980 Summer Olympics, but these Games were boycotted by the United States. Evelyn also tore a quad muscle in May, and was out for the rest of the season. Track & Field News is an American monthly sports magazine founded in 1948 by brothers Bert Nelson and Cordner Nelson, focused on the world of track and field. She would again win the sprint double, at the World Cup of Track and Field in Rome, in 1981. On July 3, 1983, she set her first World Record (be it at altitude) for the 100 metres, running 10.79 seconds at the National Sports Festival in Colorado Springs, Colorado and was one of the favourites to win the 100 metre title at the inaugural World Championships in Helsinki. In the final, however, she pulled a hamstring muscle and fell. The other main favourite, Marlies Göhr of East Germany (who had already beaten Ashford earlier that year) went on to win. These are the official results of the Women's 100m metres event at the 1984 Summer Olympics in Los Angeles, California. The final was held on August 5, 1984. 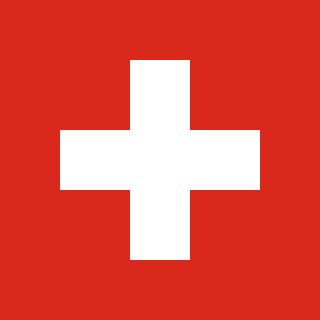 Zürich or Zurich is the largest city in Switzerland and the capital of the canton of Zürich. It is located in north-central Switzerland at the northwestern tip of Lake Zürich. The municipality has approximately 409,000 inhabitants, the urban agglomeration 1.315 million and the Zürich metropolitan area 1.83 million. Zürich is a hub for railways, roads, and air traffic. Both Zürich Airport and railway station are the largest and busiest in the country. Ashford came back from season ending injuries three times, to reach the top of the sport in the following year. In 1980 she injured her quad, and returned in 1981 with the sprint double at the World Cup and the number one world ranking in both sprints. After an injury in 1983, she became double Olympic Champion in 1984. In 1987 a hamstring pull prevented her from competing at the World Championships, then a season later added an Olympic Silver and third Gold medal to her collection. On May 30, 1985 she gave birth to her daughter Raina Ashley Washington, and again came back for an excellent 1986, losing only once over both the 100 m and 200 m, and winning the 100 meter title at the Goodwill Games; earning another No. 1 ranking by Track & Field News over the shorter distance. After parting ways with her coach Pat Connolly (herself a 3-time Olympian) in 1985, Ashford was largely self-coached. In 1997, Ashford was inducted into the National Track and Field Hall of Fame,  where she is said to be "one of the greatest track and field runners ever." Ashford went to the University of California, Los Angeles and Roseville High School. She was inducted into the UCLA Athletics Hall of Fame in 1990. Debbie Ferguson-McKenzie is a Bahamian sprint athlete of Bahamian descent who specialises in the 100 and 200 metres. Muriel Hurtis-Houairi is a French track and field athlete. She came to prominence in 2002 when she won the 200 m gold medals at both the European Indoor Championships and the European Athletics Championships. The following year she added the World Indoor title and won a bronze medal at the 2003 World Championships in Athletics and a gold in the 4×100 metres relay with France. Harvey Edward Glance is a former American track athlete, winner of gold medal in 4 × 100 m relay at the 1976 Summer Olympics. Marlies Göhr is a former East German track and field athlete, the winner of the 100 metres at the inaugural World Championships in 1983. She ranked in the top 10 of the 100 m world rankings for twelve straight years, ranking first in six of those years. During this time she won many medals as a sprinter at major international championships and set several world records. Tianna Bartoletta is an American track and field athlete who specializes in the long jump and short sprinting events. She is a two-time Olympian with three gold medals. At the 2012 Summer Olympics she placed fourth in the 100m race then won her first gold by leading off the world record-setting 4 × 100 m relay team. At the 2016 Summer Olympics she won two more golds, first with a personal best to win the long jump then again leading off the victorious 4 × 100 m relay team. Angela Williams is an American athlete. Williams attended the University of Southern California, graduating in 2002. Marlene Judith Mathews AO is a retired Australian Olympic sprinter. She has been described as 'one of Australia's greatest and unluckiest' champions. Silke Möller is a German athlete, who in the 1980s competed for East Germany as one of the best female sprinters in the world. She was a member of the East German quartet that broke the world record in the 4 × 100 m relay at the World cup in Canberra on 6 October 1985. She and teammates Sabine Rieger, Marlies Göhr, and Ingrid Auerswald ran a time of 41.37 seconds, which stood as the world record until 2012. She is the 1987 World champion at both 100 metres and 200 metres. Jeanette Bolden is an American Olympic athlete who formerly competed in the 100 metres. She is currently the head coach of the track and field team at the University of Central Florida. Sonia May Lannaman is a British former athlete, who competed mainly in the 100 metres. She won the Commonwealth Games 100 metres title in Edmonton 1978 and won an Olympic bronze medal in the 4 x 100 metres relay at the 1980 Moscow Games. In the 1977 Track and Field News world merit rankings, she was ranked number two in the world at both 100 metres and 200 metres. Alice Regina Brown is a retired American sprinter. She was a silver medalist in the 1984 Olympic 100m final in a time of 11.13 seconds. She attended John Muir High School and California State University, Northridge. William "Bill" Collins is an American sprinter, originally running for Mount Vernon High School in Westchester County, New York, where he won four state titles and later at Texas Christian University where he achieved "All-American" status. Bianca Knight is an American former track and field athlete, who competes in the 100 and 200 meters. At the 2012 London Olympic Games Knight won a gold medal as part of the American 4x100 metres relay team. 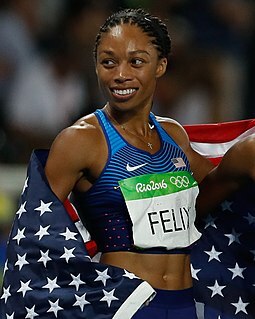 In the final, the quartet of Tianna Madison, Allyson Felix, Knight and Carmelita Jeter, also broke the twenty-seven-year-old world record. Kimberlyn Duncan is an American track and field athlete, specializing in the sprints. She was the 2013 American champion at 200 metres, having defeated Olympic champion Allyson Felix with a strong stretch run. Her time of 21.80 seconds from that race at the 2013 USA Outdoor Track and Field Championships would have ranked her as the 14th fastest female of all time, had it not been wind aided. She was 42nd on that 2013 list, from a qualifying heat at the NCAA Championships on the same Drake Stadium track a year earlier. The 4 × 100 metres relay at the Summer Olympics is the shortest track relay event held at the multi-sport event. The men's relay has been present on the Olympic athletics programme since 1912 and the women's event has been continuously held since the 1928 Olympic Games in Amsterdam. It is the most prestigious 4×100 m relay race at elite level. Phyllis Chanez Francis is an American track and field athlete, current World Champion in the 400 metres event. Kaylin Whitney is an American track and field athlete, specializing in sprinting events. Over a two-day period, at the USATF Junior Championships in Eugene, Oregon, July 5 and 6, 2014, she set the world youth bests for 100 meters and 200 meters. Her 100-meter time, set on July 5 was 11.10 with an aiding wind of +0.9 mps. Her 200-meter time was 22.49 was set on July 6 with an aiding wind of +1.3. Youth bests can be set by athletes who will not reach their 18th birthday within the calendar year of competition. Her "bests" will also count as bests on the continental and national level. Kristi Castlin is an American track and field athlete who specializes in the 100 metres hurdles. Her personal best for the event is 12.50 seconds, set on July 8, 2016 during the finals of the 2016 United States Olympic Trials, in which she qualified for the 2016 Summer Olympics by placing 2nd. She was the 2012 American champion in the indoor 60 metres hurdles and represented the United States at the 2012 IAAF World Indoor Championships. She shares the world record for the shuttle hurdle relay, with her time of 50.78 seconds set in 2013. Bernadette Jenelle "Randy" Givens is an American former track and field athlete who competed in sprinting events. She set personal bests of 11.06 seconds for the 100-meter dash and 22.31 seconds for the 200-meter dash. Givens was a 200 m finalist at the 1984 Olympic Games and represented her country at the 1983 World Championships in Athletics. She was the 200 m gold medalist at the 1983 Pan American Games and returned to win a silver medal at the 1987 edition. 1 2 3 4 "Evelyn Ashford". Summer Olympics Athletes Fan Guide. ESPN . Retrieved 20 May 2015. 1 2 3 4 Evans, Hilary; Gjerde, Arild; Heijmans, Jeroen; Mallon, Bill. "Evelyn Ashford". Olympics at Sports-Reference.com. Sports Reference LLC.